Butterfly Reflections, Ink. 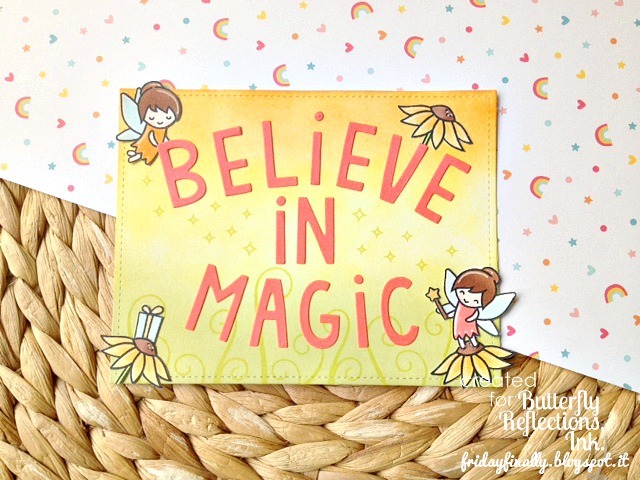 : Believe in magic! 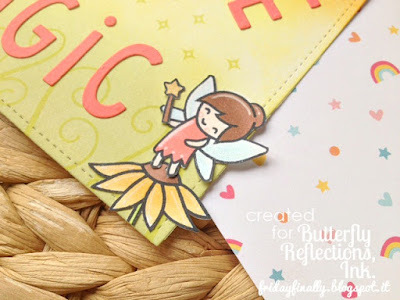 It's franci (fridayfinally) here today to show you a magical project! First i die cut the biggest stitched rectangle from the set, and i gave it some color sponging some distress inks. I used Shabby shutters and spiced marmelade distress ink shades, starting from the top and the bottom and drawn the colors to the center of the card. Then i stamped all my images on to some white cardstock with Memento Tuxedo black ink, i colored them with my copics. I fussy cut them and i i added some details wit a white gely roll pen and some Wink of Stella clear brush. I stamped some leaves and those little sparkle marks ... on my background starting from a corner into the opposite one with a green ink to add some interest and i started to build my scene. Oh and i forgot.. yes, that little present is from the Gleeful gardens stamp set by Lawn Fawn. I colored some white cardstock sponging some Abandoned coral distress ink and i put some perfect pearls on. I die cut all the letters and i glued down my sentiment with the fairies and all the other images. Here's a little detail of my favourite fairy from the set..
Hope you like my project and thank you so so much for stopping by today! Have a lovely week and see you next monday! Adorable! And the gift on ...the flower! So cute!